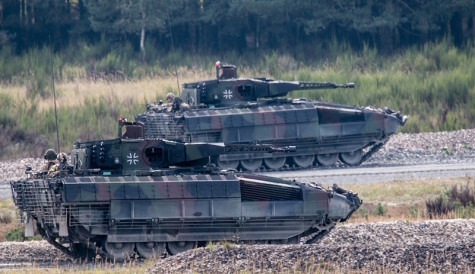 BERLIN --- Germany’s Panzergrenadiere mechanized infantry will receive one of the most modern armored infantry fighting vehicles in the world with the new Puma. Planning for the successor to the current Marder armored infantry combat vehicle began in 2002, and its operational clearance was granted in April 2015. "Unlike the Marder, the entire crew of the Puma sits in the highly-protected trough, and the turret is unmanned," explains Christoph Jansen of the Koblenz Federal Office for Equipment, Information Technology and Use of the Bundeswehr. The Government Technical Director is Deputy Project Manager for the Puma infantry fighting vehicle. "Due to its exposed position, the turret is the most vulnerable part of the vehicle, and with no crew, less armored space is needed, and at the same time, crew safety increases as does space for radios and other equipment." "Another strength of the Puma is its high first hit probability," emphasizes Jansen. "One type of ammunition has a programmable detonator. The explosion time can therefore be determined according to the objective." With the stabilized 30-millimeter automatic cannon, the fully-tracked vehicle can hit targets up to 3,000 meters away while moving. The Israeli-manufactured multi-role lightweight missile system (MELLS) can engage heavily armored ground targets, such as battle tanks, at distances up to 4,000 meters. "In addition to the Puma, another important building block in the 'Panzergrenadier system' is the armed forces’ Infantryman of the Future (IdZ-ES) soldier equipment. In addition to modern sighting equipment, it also includes modern protection equipment and weapons," explains Jansen. "All in all, the interaction between the vehicle and the IdZ-ES results in a high added value for the Panzergrenadier." Many additional "features" will be integrated in the future, such as the in 7.62mm caliber MG 5 machine-gun, which will replace the MG 4 in the Puma. The turret-independent secondary weapons system is also provided, which allows the rifle squad in the rear combat area significantly enhanced capabilities of observation and action, with lethal and non-lethal agents. Threats can be engaged both in the rear and in the flank. Full operational readiness - with all required services - will be achieved by 2024. But that also has its price. "Each Puma will cost around 12 million euros," says Jansen, “and the Bundeswehr has ordered a total of 350 vehicles."